April 23, 2019 – The 2019 Council on Legislation may not have made as many dramatic changes as the Council three years ago did, but it made several decisions that will shape the future of Rotary. Every three years, representatives from Rotary districts around the world meet in Chicago, Illinois, USA, to consider changes to the constitutional documents that govern Rotary International. This year’s Council considered more than 100 proposals. Representatives vote to close a debate on a proposal at the Council. 1.) The Council elevated the status of Rotaract clubs. The change broadens the definition of membership in Rotary International to include Rotaract clubs. The change is intended to increase the support that Rotaract clubs receive from RI and to enhance their ability to serve. The measure simply expands the definition of membership in Rotary International to include both Rotary and Rotaract clubs. 2.) Representatives authorized the Board to pursue changing RI’s charitable status to a section 501(c)(3) tax-exempt organization under the U.S. Internal Revenue Code. It is presently a 501(c)(4). A task force has been studying the possible change for 18 months and says it will offer benefits that include tax reductions and vendor discounts that will reduce expenses. 3.) As for dues, the Council approved a modest increase of $1 a year for each of three years, beginning in 2020-21. The previous Council set dues for 2019-20 at $34 per half year. With the increase, the dues that clubs pay to RI per member will increase to $34.50 per half year in 2020-21, $35 per half year in 2021-22, and $35.50 per half year in 2022-23. The dues will not be raised again until a future Council votes to change it. 4.) The Council also changed the name of the General Surplus Fund to RI Reserve, because that more accurately reflects the purpose of the fund. 5.) In another vote, the Council approved calling the general secretary a chief executive officer (CEO) in circles outside Rotary, to increase his stature in dealings with other intergovernmental organizations. 6.) A seemingly small but intensely debated action will reduce the number of nonvoting members at future Councils, by removing past RI presidents and allowing only one RI Board director to attend but not vote. But in some respects, the Council defined itself as much by what it did not do. This year’s representatives resisted pressure to limit some of the flexibility that the 2016 Council granted clubs, rejecting several measures that would have placed restrictions on clubs. One unsuccessful measure would have required clubs to meet at least 40 times each year. Many clubs have been using the innovative and flexible club formats to attract new members and meet their current members’ needs. Representatives also rejected proposals to make it optional for members to subscribe to an official Rotary magazine and to reduce the size of the Council by half and have it meet every two years. April 14, 2019 – Representatives from around the world are gathering in Chicago 14-18 April for the 2019 Council on Legislation. The Council is Rotary’s process for considering changes to the rules that guide Rotary clubs with the goal of keeping the organization modern and relevant. Some proposals this year build upon flexibility measures adopted by the last council three years ago. Follow all of the action as it happens on the live blog. Rotary members from all over the world began arriving in Chicago Saturday to discuss changes to the policies guiding Rotary clubs. The Council is Rotary’s version of a congress. Every three years, representatives selected by their districts gather to consider proposals designed to move Rotary forward and adapt to the changing times. Council members had an orientation on Sunday, and then will get down to business today, working their way through more than 100 proposals. We will have all the action here. March 8, 2019 – Make your reservations now for a special evening, hosted by the Buckhannon Rotary Club, with RI President Barry Rassin, and wife Esther to recognize several D7530 Club’s 100th Anniversary and to celebrate District 7530’s accomplishments. NOTE: Reservations are open to all District 7530 Rotarians (and spouse or guest) until March 22nd. If additional seating is available closer to the event date, we’ll announce that later. Enjoy delicious Hors D’oeuvres, entertainment, and time to mingle with President Barry and his wife, Esther. Entertainment, special awards, and remarks by President Barry following dinner. Reservations and payment must be received by Friday, March 22, 2019 to guarantee your space. ** Reserved tables will be identified for our 100 yr. clubs (Buckhannon, Elkins, Weston, Fairmont, Moundsville, and Parkersburg). Other clubs may also reserve a table seating 8 (max. of 10) by sending one check indicating club name and number seats needed with the appropriate payment. District 7530 Rotarians … mark your calendar now to enjoy this rare opportunity for an evening with our Rotary International President. 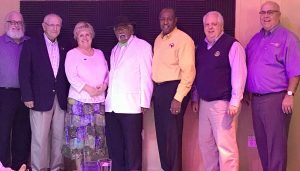 The Rotary Club of Buckhannon recently announced Rotary International President Barry Rassin, and his lovely wife Esther, from Nassau, Bahamas, will be visiting the area to help celebrate their club’s 100th Birthday. He’ll also be recognizing the 100th birthday of fellow clubs in the area including Weston, Elkins, Fairmont, Moundsville and Parkersburg. The Rassins will be visiting area service projects and bestowing some Rotary Foundation awards. This is truly an honor for area clubs (and District) as this is the first time a current Rotary International President has visited this area. The Rassins will be here March 29, 2019 for an evening of Rotarian fellowship at the Bridgeport Conference Center, Bridgeport, WV. More information concerning reservations and times will be made available as plans are finalized. All Rotarians are encouraged to put that weekend on your calendar for a rare opportunity to meet RI President Barry Rassin! Mark your calendars for the multiple-club “RISE Against Hunger” event that will take place March 30 from 8:45 a.m. to 11 a.m. at the Wesley United Methodist Church in Morgantown. The entrance of the Wesley United Methodist Church area, where the event is being held, is across the street from Panera Bread, which is positioned at the top of High Street. This is a multiple region/club service project. Rotarians and guests of the area are welcome to explore volunteering at this RISE event. See you there! March is Water and Sanitation Month throughout Rotary. Clean water is a basic human right that many are often denied. Rotary members are committed to reaching the water and sanitation sustainable goals through projects like building wells, installing rainwater harvesting systems, and teaching community members how to maintain new infrastructure. This year, your District contributed to a Zone 33/34 water and sanitation project in Uganda, to honor the late Sam Owori, who died before he could become RI President last July. Thank you for this, Rotarians! For more information. February 26, 2019 – District 7530 Grants Training Seminars scheduled for March 2 and March 30, 2019 have been cancelled. New dates will be announced at a later date after District 7530 and District 7550 leadership Transition Team determine grant procedures for the new combined D7545. Clubs need to attend to qualify for district grant funds. District 7530 Grants Training Seminars will be held March 2 and March 30, 2019. Clubs need to attend just one to qualify for district grant funds. The Saturday, March 2 GTS will be held in Parkersburg at the Blennerhasset Hotel. 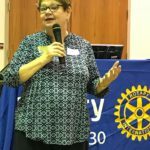 Nancy Barbee, highly renowned Rotarian from Zone 33, will lead the training in Parkersburg. The second GTS will be held Saturday, March 30 at Crosley’s Banquet Center in Morgantown. The District 7530 committee will handle the Morgantown training. Both seminars will start at 10 a.m. and conclude at 3 p.m. Lunch will be provided at both. There is no cost to attend. Groups from the same club are encouraged. Please email Dave Raese the name(s) of club members attending to provide a head count for the lunches. This training is mandatory for any Club hoping to receive a District Grant during the 2019-2020 Rotary year. At least one Club member must attend this training for a Club to become qualified to receive a District Grant. March 8, 2019 – Rotary Leadership Institute (RLI) added two new faculty members to their list of Zone 33 Facilitators. Rotary Club of Fairmont Membership Chair and District 7545 Training Officer, DGN Sean Jeffrey Sawyer and Mountain State Rotary E-Club Public Image Chair and PE, Bonnie Branciaroli traveled to Blacksburg, VA the weekend of February 8-9 to complete their RLI faculty training. The purpose of the Rotary Leadership Institute (RLI) is to strengthen Rotarian leadership roles. Rotary provides an opportunity for all of us to serve our community and communities throughout the world. (Service Above Self) With that service comes a learning experience in the areas of leadership, team building, planning, marketing, communication and organization. RLI provides an opportunity to enrich that learning through sharing experiences and ideas with other Rotarians throughout the region. For those interested in honing their leadership skills, a full RLI schedule is available at www.rli33.org. These Public Image classmates later became RLI graduates: (L to R) Vivian Atkinson, Rotary Club of Ceredo-Kenova; Bonnie Branciaroli, facilitator; Sara Ramezani, Rotary Club of Barboursville; Cindy Farley, Rotary Club of Putnam County; and Wayne Kersey, Rotary Club of St. Albans. Back row, DGE Shari Messinger. The new faculty members had a chance to flex their new facilitation skills on March 2 in South Charleston during a full day of Part I, Part II and Part III classes. Sawyer immersed his group into Part II Ethics and Branciaroli partnered with DGE of new D7545, Shari Messinger, to facilitate a Part III Public Image course. We all know PI and RLI is fun, just as the photo suggests! Four Rotarians from the Southern WV District of 7550 joined the RLI graduation ranks during the Rotary Leadership Institute (RLI) held on Saturday, March 2, at BridgeValley Community and Technical College in South Charleston. Rotary Leadership Institute (RLI) will be held on Saturday, March 2, at BridgeValley Community and Technical College in South Charleston. The cost is $95 per person. Many Clubs pay the registration fee for their members to attend. If a club sends four members, the fourth member is free. This is a wonderful opportunity for you and your Club to learn more about Rotary. All incoming Club Presidents are encouraged to attend along with Club Officers. This is a wonderful opportunity for new Rotarians to learn about Rotary. Each Part takes a day to complete and the Parts must be taken in order. Registration begins at 8:30 a.m. with the sessions beginning at 9:00 a.m. concluding at 4:30pm. Lunch is provided with refreshments for the breaks. To register go to: www.rli33.org. Click on Event Registration then scroll down to South Charleston and select the appropriate Part. Some of you have completed Part I and should register for Part II. Others have completed Part II and should register for Part III. If this is your first RLI, you must register for Part I. We would like to receive all registrations by February 26 to adequately plan for lunch and prepare the materials. For more information: Harry Faulk, PDG, District 7550, 304-894-4838. Our District 7545 transition team met to work on combining D7530 and D7550 by July 1, 2019. The team included the Governor Chain, committee chairs and a team leader from each district to make it work, on time. We made significant progress and plan to hold the next one by teleconference. There are no “hard spots” yet, and we want to make this transition as smooth as possible. Remember, it should have little or no effect on your club’s operations. We’ll keep you advised of our progress. Rotarians from two West Virginia districts came together for the first time to discuss Membership growth options. Over 60 Rotarians, representing 28 clubs from two West Virginia districts gathered at the Fairmont State University Gaston Caperton Center in Clarksburg, WV on January 5, 2019 to discuss options for district membership growth. 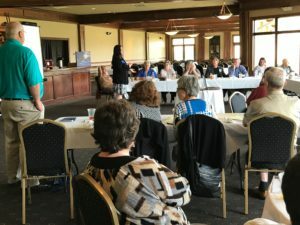 District Membership Chair and organizer, Rebecca Hunn, noted that the seminar was the first event to bring together leadership and Rotarians from two West Virginia Rotary districts that will consolidate into one district on July 1, 2019. Jordan Feathers and Lindsay Williams of the Rotary Club of Cheat Lake. Presentations included innovations in recruitment, alternative membership plans, alternative meeting schedules, public image, and ramping up the fun and excitement in Rotary club meetings. 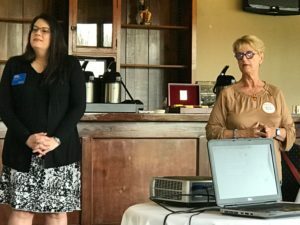 Jordan Feathers, president of the Rotary Club of Cheat Lake, and Lindsay Williams, current Membership Chair and incoming 2019-20 president, spoke to the group explaining how clubs can become a ‘vibrant club’ and offered ways to entice younger members. Sharon Welsch of the Rotary Club of Moundsville offered suggestions on how to increase corporate members. Corporate members make up over 25% of the Moundsville club. The afternoon session concluded with panel discussions and a Q&A audience participation session. A workbook is available for download offering ideas, plans, details, reference materials and links to important Rotary resources. Members of District Leadership from two West Virginia Districts: 7530 and 7550, met in Clarksburg in early January to discuss membership growth in a new consolidated Rotary district: 7545. District Governor Micheal Davidson announced Friday, November 2 that District 7530 (Northern West Virginia) will be merged with the southern West Virginia District 7550 over the next eight months. On July 1, 2019, a new district will emerge – D7545. West Virginia economics, loss of jobs and the continuous population drain have been factors that brought officials at Rotary International to request the merger. Both districts have Governor-Elects and Governor-Nominees in the wings, and all will become DG’s, but at a slower pace. Both districts will sit down together and coordinate the merger process. Rotary International will be available as an advisory body only. The organization noted that Rotarians living in both districts best understand the people, economy and issues of those areas. The 2019 District Conference will be held May 3-5, 2019 at Oglebay Resort & Park in Wheeling, West Virginia. According to DG Mike Davidson, Oglebay is a very family-friendly resort and park that is ideal for family outings. Plan on making this conference a mini-family vacation. The 2019 Rotary International Convention will be held in Hamburg, Germany June 1 – 5. To take advantage of early registration savings, be sure to register before December 15 at riconvention.org. You’ll learn about new ideas, hear different perspectives, and gain new skills through engaging speakers, breakout sessions, and exhibits in the House of Friendship. Don’t miss out on the most inspiring convention yet! HURRICANE NEWS 9.15.18 – DONATE NOW! I just posted on the Rotary Zones 33 & 34 Facebook page the announcement of our collaborative action to raise contributions for Hurricane Relief in Zone 33. If you have Facebook, please go there, like it, and share it to everyone in your individual district. Place it on your personal Facebook page. And, yes, please make a contribution. A printed form can be downloaded here, which you can share, if desired. Please share this information immediately around your district. Be The Inspiration for the Rotarians and their communities in RI Zone 33. Thank you so much for considering this opportunity to help others in need. 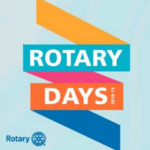 “Rotary Days events will offer you the chance to have an impact in your community, build long-term partnerships, increase interest in membership, and improve Rotary’s image,” Rassin said. “Imagine the collective impact we can have if all 35,000 Rotary, 10,000 Rotaract, and 22,000 Interact clubs engage their neighbors, friends, young people, and organizations,” Rassin said. District 7530 Youth Exchange students. Back Row: Rodrigo Kagueama, Colin Derudder. Photo taken at the 2018 District Conference in Weirton, WV. 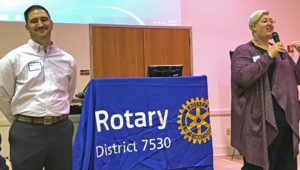 Dennis Shreve, Youth Programs Coordinator and member of the Rotary Club of Harrison County, will be keeping us updated on the District’s Youth Exchange program. According to Shreve, July is a big month of transitions for Rotary Youth Exchange as we say “See You Later” to our 2017-18 inbound students, help our 2018-19 outbound student prepare for his year abroad and work feverishly to finalize paperwork, meet with Host Families, Youth Exchange Officers, Counselors and Host Clubs to prepare for the incoming exchange students for 2018-19. Check back often to keep “in the know” with our international youth program. Click to download July newsletter (pdf). Time: 9:30 Registration; 10:00 – 3:30 Assembly. Please register by June 29. Cost: Each attendee asked to pay $10 at door to cover the cost of lunch. Cash or check only, made payable to Rotary District 7530. Bring: Please bring a laptop or tablet that can operate within DACdb. Questions? Please contact District Trainer Mary Dean at madbuhs66@aol.com . You can register on DACdb under the CALENDAR tab. Renee Reiling, RI Regional Grants officer and Nancy Barbee, Zone 33 Regional Rotary Foundation Coordinator (left). District 7530 team leaders hosted a Grant Seminar on Saturday, April 14 at the Pete Dye Golf Club in Bridgeport. The seminar was facilitated by Renee Reiling, Regional Grants officer from Rotary International headquarters in Evanston, IL. and Nancy Barbee, Zone 33 Regional Rotary Foundation Coordinator, who traveled from North Carolina. The all-day seminar involved several sessions outlining the process to apply for Global grants and then, settled into details on upcoming District grants requirements and deadlines. 2018 Grant Seminar for District 7530 clubs.District 7550 in August. Representatives from those clubs should contact Dave Raese, 2017-18 Foundation Chair, for more information on the District 7550 event. Raese also announced during the seminar that the deadline for new 2018-2019 grant submissions has been moved up to June 14, 2018 and the deadline for Final Reports for 2017-2018 grants is June 30, 2018. 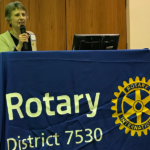 In an effort to streamline grant approvals with the beginning of the new Rotary year, District 7530 team leaders announced at the recent District 7530 Grant Seminar held Saturday, April 14 that the deadline for 2018-2019 District Grants has been moved up to June 14, 2018. Dave Raese, 2017-18 Foundation Chair, said the new grant forms are available on the new District web site (rotarydistrict7530.org) and the deadline has been moved up from September to June to coordinate approval of grants with expenditure of those grant funds within the funding year. All grant forms for 2018-2019 can be found here. Deadline for the FINAL REPORT for all 2017-2018 District Grants is June 30, 2018. As discussed at the recent District Grants seminar hosted by district team leaders, Dave Raese, 2017-18 Foundation Chair and Jim Culberson, Grants Chair, it is imperative that all Final Reports by to Jim Culberson by the end of June. More information, Culberson’s contact info and all grant forms can be found here. For more than 100 years, The Rotary Foundation has been supporting Rotarians’ work to create sustainable solutions to our world’s most pressing needs. But there is still much to do, and we need your help. Rotary gives in countless ways, focusing our service efforts in six areas: promoting peace, fighting disease, providing clean water, saving mothers and children, supporting education, and growing local economies. We’re also working hard to end polio once and for all. Give the gift of Rotary today and be a part of the positive change Rotarians are making in your community and around the world. Every gift makes a difference. GIVE THE GIFT! The Congress of Governors annual dinner was held in Morgantown recently at the Crab Shack Caribba. The evening of fellowship included dinner, and a District 7530 meeting including presentations and a short photo opportunity. District Governor David Whalen presided over the meeting and outlined his agenda for the year. Past District 7530 Governors (left to right): Dennis Shreve, (Harrison County – 1997-1998), ‘Jack’ Porter, (Morgantown –1999-2000), Mary Dean, (Buckhannon – 2000-2001), Dr. Subramoniam Jayakumar, (Weirton – 2005-2006), Michael Ellington, (Morgantown – 2014-2015), Mike Kirkpatrick, (Cheat Lake – 2015-2016), and Dave Raese, (Morgantown – 2016-2017). District 7530 Governor Elect Mike Davidson presented Immediate Past District Governor (IPDG) Dave Raese with two Rotary Foundation certificates. These certificates commended District 7530 and then-Governor Raese for donating over 20% of the District Designated Funds to the PolioPlus campaign during 2016-2017. Established in 1985, PolioPlus is Rotary’s first initiative to tackle global polio eradication through the mass vaccination of children. Rotary has contributed more than $1.7 billion and countless volunteer hours to immunize more than 2.5 billion children in 122 countries. IPDG Raese is a member of the Rotary Club of Morgantown. Present were past District 7530 Governors (left to right): Dennis Shreve, Rotary Club of Harrison County – 1997-1998), ‘Jack’ Porter, Rotary Club of Morgantown –1999-2000, Mary Dean, Rotary Club of Buckhannon – 2000-2001, Dr. Subramoniam Jayakumar, Rotary Club of Weirton – 2005-2006, Michael Ellington, Rotary Club of Morgantown – 2014-2015, Mike Kirkpatrick, Rotary Club of Cheat Lake – 2015-2016, and Dave Raese, Rotary Club of Morgantown – 2016-2017. It’s time to start planning for your club’s World Polio Day event. My Rotary has lots of information to help you get started. Go to My Rotary to find resources and a toolkit for planning. Find more resources at the End Polio Now web site. There are all kinds of different ideas. It’s a great opportunity to raise money for Polio Plus as well as build Rotary’s public image and attract prospective members. Rotary clubs along the Gulf Coast of Texas and Louisiana, USA, are collecting emergency relief funds to help flood victims of Hurricane Harvey, which slammed into southeast Texas over the weekend. More information can be found here. Deadline for District Grants for the 2017-2018 Rotary year has been extended to September 15, 2017. Remember to review the 2017-2018 District 7530 Terms and Conditions and submit a 2017-2018 Memorandum of Understanding (MOU), signed by your Club’s current President and President-Elect. Send all paperwork to District Foundation Chair, David Raese. If using snail mail, email David Raese for mailing informaton. More information and all grant forms can be found here. If your Club is interested in applying for District Grants for the 2017-2018 Rotary year, review the 2017-2018 District 7530 Terms and Conditions, submit a 2017-2018 Memorandum of Understanding (MOU), signed by your Club’s current President and President-Elect, and send to District Foundation Chair, David Raese. More information and all grant forms can be found here. August is Membership and New Club Development Month, which means it’s time to celebrate your Rotary club, its members, and the good you do in your community and around the world. Discover new ideas to help spread the word about Rotary. Here’s an opportunity to either begin your Rotary Leadership Institute training with RLI Part I, or strengthen that training with Part II or Part III. An RLI is scheduled for Saturday, August 26 in Morgantown at the Mountainlair Student Union of West Virginia University. The Mountainlair is located at 1550 University Avenue in Morgantown, WV 26506. Payment of $95 must be made at time of registration for registration to be confirmed. Registration begins at 8:30 a.m. and Sessions start at 9:00 a.m. Lunch and Breaks are included and Sessions conclude at 4:30 p.m. Registration: Day and Place of Seminar begins 8:30 a.m. Sessions begin at 9 a.m.
Twenty-five members from District 7530 attended the International Conference in Atlanta, June 10-14, 2017. Let’s send more than 25 to Toronto! Please check out the 2018 Rotary International Convention. Some disturbing facts from The Rotarian. It is estimated that 422 million adults worldwide had diabetes in 2014, nearly quadruple the amount who had it in 1980. This will be a hard problem to solve since it can’t be stopped with a simple vaccination. It will take education and changes in diet to curb the disease. Making it even tougher is the fact that the food industry must change as well, to not make it so easy to acquire foods and drinks that lead to the disease. New cases of polio reported in 2016 was 26. That’s 14 in Pakistan, 9 in Afghanistan, and the 3 that were reported in Nigeria, bumping it off the polio-free list. Last year, there were 74 new cases, so it still looks like we’re bringing that number down closer and closer to the Big Zero. Don’t forget, World Polio Day is Tuesday, Oct. 24 and clubs are encouraged to thump the tubs to raise awareness about Rotary’s mission to end polio. Remember, many young people are unaware of polio. So it is important that we get the word out. For ideas, go to https://www.endpolio.org.